Do all the station residents do space walks, or just a few of them? The training for it looks very intense! All the space station residents are trained for spacewalks. 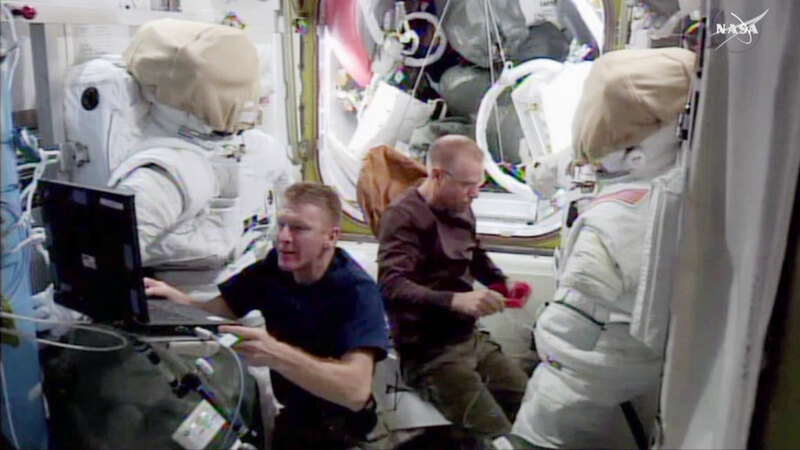 Not all crew members have the opportunity to conduct a spacewalk though. It looks there is more work on ISS , than on the Earth to do, both physical and scientific jobs!!! And you are looking GREAT . What do the astronauts have to do to ‘prepare’ the spacesuits for the spacewalk? The astronauts ensure the spacesuits are fitted properly, all the parts are working and their batteries are charged. All the best for the Space Walk, an Amazing experience. I felt we live our usual life on the nature earth by science included the physics of the universe. There was special techniques of the universe at hand. I am looking forward to that how it will develop towards the future and hopefully the next spacewalk will be success! I think space walk is important and amazing experience. Good luck to Tim Peake and Tim Kopra. I am a third grade teacher at Akron Elementary School in Akron, NY. My students are wondering- What does it feel like to walk on the moon? Simply wanting to wish the Two Tims all the best of luck for their “space walk” on 15th Jan., esp our Major Tim Peake, whose 1st Walk this will be. Hope it is the most amazing, mind-blowing, life-changing experience for you. God bless, keep safe and every success on your repair project outside the ISS. You instil a heart-bursting pride to be British in me more than any other cause. So proud of you.